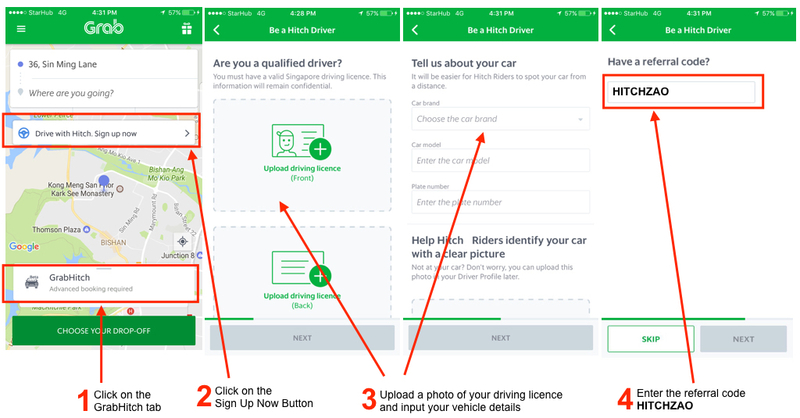 Anyone with a valid driving license can sign up as a driver with GrabHitch! Signing up as a driver takes less than 5 minutes! Upload photos of your driving licence (front and back), a selfie and your vehicle details. You MUST enter your referral code HITCHZAO to get your $30 credit after you completed your first GrabHitch ride as a GrabHitch driver. Your application will be approved in 1-2 working days. You will be notified and can start driving upon approval! This incentive is only eligible for new drivers who sign up and successfully complete 1 Hitch ride as a driver between 6th Nov 2017@ 00:00 hours – 30th Nov 2017 @ 23:59 hours. New drivers must sign up with the referral code HITCHZAO in order to qualify for the $30 credit. The processing of the $30 credit will only be conducted after the incentive period has ended (post-30th Nov 2017). The $30 credit incentive is not exchangeable or refundable for cash or credit. Please allow up to 10 working days for the $30 to be credited into your driver wallet.